According to new research published in the May issue of the journal “Health Affairs,” the health expenses of children who were sick due to toxic chemical exposure and air pollution, cost the United States a whopping $76.6 billion – and that was just in 2008 alone. The new research focuses on the costs related to lead poisoning, prenatal methylmercury exposure, childhood cancer, asthma, intellectual disability, autism, and attention deficit hyperactivity disorder. Principal findings of this research show that chemical factors in the environment continue to contribute greatly to childhood morbidity and quickly rising health care costs. Worse, it’s not as if we haven’t seen this coming. Exhibit 1 shown above: Costs attributed to environmental factors for each condition studied. $5.9 million in medical care costs to treat childhood lead poisoning. $50.9 billion lost economic productivity due to reduced cognitive potential from preventable childhood lead exposure. $5.4 billion in intellectual disability costs. $7.9 billion in autism costs. $5.0 billion in costs for attention deficit hyperactivity disorder that could ultimately be attributed to chemical factors in the environment. Overall, the research found that $11.6–$36.1 billion in economic costs of developmental disabilities could be attributed to hazardous environmental exposures. While $3.3 billion of these costs were due to direct medical costs, researchers also found that $4.0 billion could be attributed to indirect costs, such as lost productivity resulting from parents’ caring for sick children. Additionally, the researchers feel that there are much broader, and harder to track economic consequences involved here. For example, the study points out that there’s an association between childhood lead exposure and criminal activity including homicides and robberies later in life. These adult-minded consequences and costs associated with childhood exposures may up the actual costs of toxic exposure considerably. Stupidly enough, the government knew this was coming and yet did nothing. 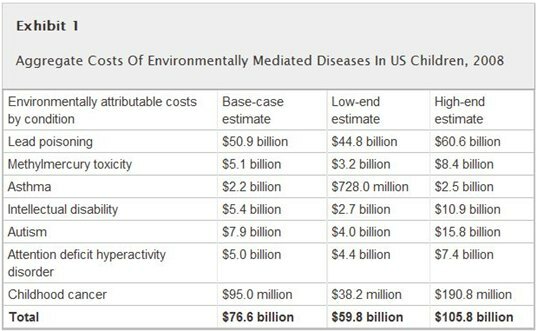 Way back in 2002 an analysis showed that it cost $54.9 billion annually, to care for U.S. children affected by environmentally mediated diseases. Of course, in the years since that costly analysis was completed, this country has done almost nothing related to keeping kids safe from toxins and pollutions. For example, the U.S. has failed to update the 1973 Toxic Substances Control Act so that it requires chemicals be tested for toxicity before being approved by the Environmental Protection Agency (EPA) for widespread use. To prevent further increases in these costs, the researchers propose that the United States pass new legislation that not only requires testing of new chemicals but also tests those chemicals already on the market. The researchers also suggest that America needs to reduce lead-based paint hazards and curb mercury emissions from coal-fired power plants. + Tell Congress to Get Moving on Toxic Chemical Safety for Kids! Lead image © kkiser via sxc. According to new research published in the May issue of the journal "Health Affairs," the health expenses of children who were sick due to toxic chemical exposure and air pollution, cost the United States a whopping $76.6 billion - and that was just in 2008 alone. The new research focuses on the costs related to lead poisoning, prenatal methylmercury exposure, childhood cancer, asthma, intellectual disability, autism, and attention deficit hyperactivity disorder. Principal findings of this research show that chemical factors in the environment continue to contribute greatly to childhood morbidity and quickly rising health care costs. Worse, it's not as if we haven't seen this coming.